Paul Ryan can save House Republicans from themselves. Here’s how. 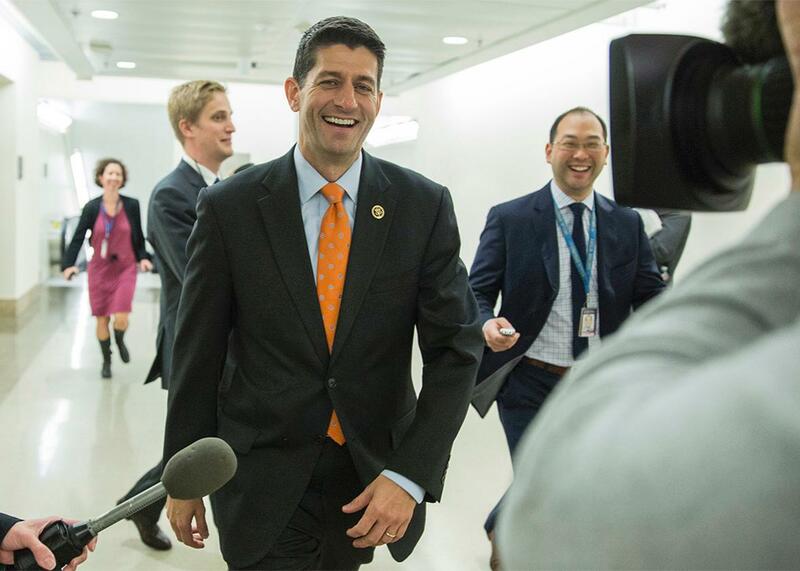 Rep. Paul Ryan leaves a meeting about his bid to be the next speaker of the House with moderate members of the House Republican caucus on Capitol Hill in Washington, D.C., Oct. 22, 2015. Last fall, Paul Ryan told reporter Tim Alberta that he had absolutely no intention of serving as speaker of the House and indeed that he hoped to leave politics entirely in a few years. Why did he change his mind? The short of it, according to Alberta, is that after weeks of panicked phone calls from Republican luminaries, the Wisconsin congressman was persuaded that if he failed to step up to lead Republicans in the House, the chaos and dissension that would result would badly damage if not doom GOP prospects in 2016. Having won over most of the Republican rebels who made Speaker John Boehner’s life a living hell, Ryan is all but certain to win the speaker’s race. This was no small feat. Roughly 70 percent of the members of the House Freedom Caucus have backed Ryan despite serious misgivings about Ryan’s heresies on the infamous Wall Street bailout (he voted for it), the fiscal cliff deal (he voted for that too), and amnesty for unauthorized immigrants (he’s for it). That means that henceforth, it is Ryan who will be charged with the unenviable task of preventing future outbreaks of Republican-on-Republican violence. How will he manage it? The smartest thing Ryan has done so far is pledge not to push for comprehensive immigration reform legislation as long as President Obama is still in office. It is no secret that Ryan supports giving unauthorized immigrants a path to citizenship and increasing legal immigration. In 2005, he co-sponsored the McCain-Kennedy immigration bill that set off a Republican civil war and helped set the stage for huge Democratic victories in the 2006 congressional elections. And Ryan has been willing to work with Democrats in the years since, to the chagrin of conservative Republicans who oppose amnesty in any form and who want to see immigration levels reduced. This week, however, Ryan has assured anti-immigration conservatives that he no longer sees the president as an honest broker on immigration and that he recognizes that comprehensive reform is “too divisive” to take on, at least for now. But he has said that he would be open to immigration legislation that unites Republicans in Congress, like measures that strengthen immigration enforcement. One of the more persistent concerns of immigration hawks is that while border security has been tightened, far more could be done to improve worksite enforcement and employer verification and to help ensure that visa overstayers are identified and removed. By backing meaningful immigration enforcement legislation, Ryan would go a long way toward healing the GOP’s biggest divide. Every other issue is going to be more challenging. Earlier this year, the political scientists Matt Grossmann and David A. Hopkins published an article on the fundamental asymmetry in U.S. party politics. Grossmann and Hopkins observe that while the GOP is best understood as “the agent of an ideological movement whose supporters prize doctrinal purity,” the Democratic Party is “a coalition of social groups seeking concrete government action.” To oversimplify matters, Democrats are far more inclined to believe that half a loaf is better than none while Republicans tend to fixate on questions of principle. Ryan’s central challenge as speaker is that he fully appreciates something that many of his colleagues do not, which is that only a minority of Americans are committed ideological conservatives. To win elections and pass legislation, you must persuade at least some people who don’t share your ideological priors. Ryan’s pragmatic streak is why he has spent much of the past few years trying to craft bipartisan proposals to fight poverty and trim the budget deficit, despite the fact that doing so has lost him at least some friends on the right. Several of Ryan’s supposed heresies reflect an understanding that, as he said to the conservative journalist Philip Klein in 2010, “Sometimes you have to take votes you don’t want to take, but they’re the best of two choices.” As an example, Ryan explained to Klein that the reason he backed the Wall Street bailout is that he feared the alternative would have been an economic collapse, which in turn would have paved the way for a massive expansion of government. Similarly, Ryan is lambasted by conservatives for backing the Medicare Prescription Drug, Improvement, and Modernization Act of 2003, a sprawling, expensive proposal that established a new Medicare prescription drug benefit. He defends his vote by saying that had Congress not passed the Medicare Modernization Act, it would have passed some other Medicare-expanding legislation that would not have included its various free-market reforms. Judging by the growing popularity of Medicare Advantage, the optional Medicare private insurance plans that were one of the chief fruits of that legislation and which many conservatives see as the basis for future Medicare reform, it seems that Ryan was right. Over the long term, the Medicare Modernization Act has left conservatives in a better position to advance their goals than another bill that would have just established a new prescription drug benefit and left it at that. Half a loaf really did prove to be better than none. The question is whether Ryan can persuade his fellow House Republicans that incremental progress is worth fighting for. The greatest danger facing Republicans in the coming months is what you might call the politics of wishful thinking. Paul Ryan’s job will be to convince Republicans, including Freedom Caucus Republicans, to face certain realities. On the budget, Freedom Caucus Republicans believe that they can extract concessions from President Obama and his Democratic allies because they can force a government shutdown. What they don’t seem to realize is that if they force a government shutdown, they’ll be blamed for it. Roughly the same logic applies to the debt limit increase. The president is unwilling to bargain with Republicans to get a debt limit increase, and for good reason—it makes absolutely no sense to have to authorize an increase in the debt limit when Congress has already voted to spend more money than the Treasury collects in taxes. Members of the Freedom Caucus might believe that they’re doing the White House a favor by agreeing to increase the debt limit, but almost no one else in the country sees it that way. Another drawn-out debt limit fight can only end in tears for the GOP. Why does Ryan have a better shot at selling Republicans on pragmatism than Boehner or Kevin McCarthy? It’s simple. While it’s never been clear exactly what Boehner or McCarthy stand for, most conservatives, including diehard Freedom Caucus Republicans, recognize that Ryan is a conservative true believer and that every pragmatic accommodation he makes is with an eye toward moving government in a more conservative direction. Ryan’s critics might not agree with him on every tactical decision, but they recognize his sincerity and his commitment. That counts for something. Whether it will be enough to keep the fractious House Republican Conference together is another story.